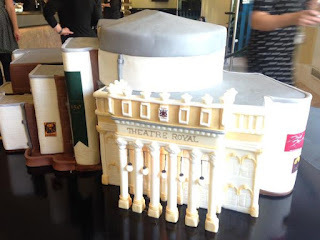 I recently helped Dawn from Dinkydoodle Designs create a cake for the 150 anniversary of the Nottingham Theatre Royal. The cake was presented to Prince Edward as part of the celebrations and he had the honour of cutting it. The cake was built in 2 halves and 5 floors, each floor had a baseboard (laser cut), built up with sponge cake and covered with chocolate ganache before the decoration and detailing went on. The floors were separated with cake frame to stop them squashing the sponge (now available from Lakeland plastics apparently). My involvement didn't stop with base boards though, once the basic shape was carved out I was called back in to wire the cake with lights. The front porch is lit, the chandelier and auditorium were illuminated with LED strips and the stage area was lit with a WS2811 strip and an arduino nano changed the colours every 10 seconds to give a sense of movement. Here is a little video tour of the cake once it was opened. This project was remade from the first prototype and it was ready for my Cambridge workshop on the 13th, it's just taken me an additional 2 weeks to actually write about it. The principle is very much the same, I have fully enclosed the range with perspex to make it better at keeping the ammo in the range but also added a few other features. This time I ran the strings over the top of the board. It was easier than worrying about routing the string past the braces on the underside of the board but also it allows the kids to see a greater connection between the levers and the targets. In Cambridge nobody asked what the levers were for so I guess it served it's purpose. The levers are now vertically mounted so that gravity pulls them down again, this makes the string slack while resting and the targets more likely to fall over. 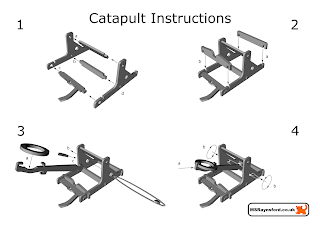 The targets themselves are now bolted to the base board rather than glued, this makes them nigh on impossible to break off with catapult shot. This is another large cake framework for Dinky Doodle cakes, This is taken from a floor plan of the theatre royal in Nottingham, each layer is a different floor of the building and it will be used to create the whole building from cake. The top layer is a roof because inside the cake the auditorium will be recreated with lights and a stage. This is Dawns model of the cake that she cut by hand to show me what we are doing. Not every project can be a success and there is a popular mantra that you should fail and fail fast. You learn from failures and the sooner you get them out the way the sooner you can move on to the right ways. I don't have a lot of failures, I have a lot of projects that get put on hold until I know how to progress them, some of them are on indefinite hold at the moment. Tonight's project has been on the cards for a few months but it failed and relatively quickly so I thought I would write about it as I'm no longer working on it.